Goodness, Monday’s always sneak up on me you know – it is here again, and what does that mean, it means it is time for another Parenting Pin it Party. 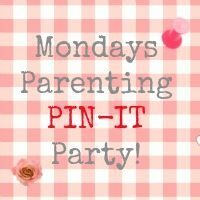 This week we are heading on over to Mum of One; and it is there that you can deliver the delight that is the hostess with the mostess as they hand out cocktail sausages, and cheese and pineapple on sticks to you all as we discover the wonders of Pinterest. finally, include the badge for the host on the post that you used in the blog hop. Just to show a bit of love if you can.